Now that my comprehensive exam process is over, I’ve been busy grading papers and reading my first guest recommendation. I won’t spoil the surprise, but I will tell you what I’m going to read next: The Song of Achilles by Madeline Miller. I was intrigued by the story because it’s written by a woman with a BA and MA in Classics who now teaches the subject to high school students. This is her first novel, and it’s an adaptation of Homer’s Iliad in Patroclus’ perspective. It has gotten rave reviews, so I’m excited! But if you haven’t read the original tale of the Trojan War, pick up an English translation pronto! (I recommend Lombardo or Fagles). Nothing beats the ancient Greek poetry, but the best translators succeed in balancing the descriptions and the poetic form. Originally sung by Greek poets and attributed to Homer in the 9th c. BCE, it’s an epic about the war between Greece and Troy (an empire allegedly located in modern-day Turkey). Now this story has an extensive character list, so bear with me through this summary! Trojan prince Paris has stolen Spartan king Menelaus’ wife Helen–yes, the cliche that launched a thousand ships. Menelaus’ brother Agamemnon has brought along Achilles, the strongest warrior in all of Greece. 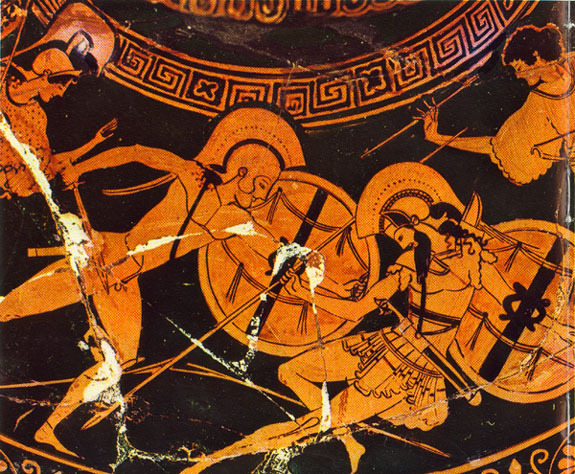 Achilles, thanks to his mother, is practically immortal, save for his famous tendon. However, his mother knows that Achilles will die in the war, and when she tells him of his doom, he goes to Troy anyway to seek glory. However, Achilles becomes a reluctant soldier after Agamemnon steals his slave-girl Briseis. Because he refuses to fight, his cousin/closest friend/implied lover Patroclus takes Achilles’ armor and pretends to be him in battle. Not until Patroclus is murdered by Paris’ brother Hector does Achilles seek revenge and become emotionally invested in the war. Cue the bloodbath! And there’s tons more extremely graphic death scenes where that came from! But unfortunately, the Iliad does not cover the whole story of the Trojan War; in fact, it fails to include the crucial before and after scenes: The Judgment of Paris, in which the prince wins Helen in a goddess girl fight, and the Trojan Horse, which inspired an entire class of computer viruses thousands of years later. So anyone else obsessed with all things Greek? What other tales or myths would you love to see reviewed? This entry was posted in Book Review, Masterpiece Monday and tagged Achilles, Ancient Greek literature, epic, Homer, Iliad, Patroclus, Trojan War by Book Club Babe. Bookmark the permalink. Thanks! The Iliad is a long read, but so worth it! I hope you get around to it someday!